Secretary-General Ban Ki-moon delivers lecture at Stanford University in Palo alto, California. “Throughout the ages, people have said that the world is in the midst of big change. But the level and degree of global change that we face today is far more profound than at any other period in my adult lifetime. I call this period the Great Transition,” Mr. Ban told the audience in Palo Alto, California. In his speech, entitled ‘The United Nations in a World in Transition,’ the Secretary-General noted that the transition is economic, as engines of growth and economic power continue to shift with the rise of the Asia-Pacific region. The transition is developmental, as the world seeks a more sustainable path for people and the planet. The transition is also political as landmark change in the Arab world and beyond brings new hope to places that have long been deserts of democracy. He highlighted three essential ways to navigate through this Great Transition: by truly advancing sustainable development; by helping people meet their aspirations for democracy and dignity; and by empowering women and young people. On sustainable development, Mr. Ban pointed out that in the next 20 years, the world will need at least 50 per cent more food, 45 per cent more energy and 30 per cent more water. He noted that, with the eighth-largest economy in the world, California has a special role. “Your state has blazed the trail on clean air legislation – and recently put into effect a first-of-its-kind market-based, cap-and-trade law to reduce greenhouse gas emissions,” he said. “I am convinced national and state action can spur progress in the global negotiations, creating a virtuous cycle. This will help us reach our goal of a legally binding global agreement by 2015. While working to achieve sustainable development, it is also vital to strive for sustainable peace, the Secretary-General stressed, highlighting in particular the ongoing tragic conflict in Syria. He noted the constraints faced by the UN in its humanitarian efforts in the Middle Eastern nation, which has been experiencing escalating violence since the uprising against President Bashar al-Assad began in early 2011. Recent months have witnessed an escalation in the conflict, which is now in its 23rd month. The UN humanitarian appeal is less than 50 per cent funded, while access continues to be a problem, with UN and other humanitarian actors not able to physically reach all people in need. Meanwhile, diplomatic efforts continue in the hope of finding common ground and resolving the Syria crisis. Mr. Ban also cited ongoing efforts to help Mali counter terrorism and restore constitutional order, as well as to ensure peace, justice and human rights in the Arab World and beyond. “Hard-won gains must not be reversed, particularly for all those women and young people on the frontlines,” he stated, adding that the final key to advancing common goals in this world in transition is empowering the world’s must underutilized resource – women and young people. 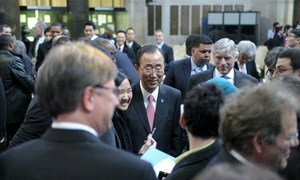 This time of Great Transition is also a period of great opportunity, according to the UN chief. “And I believe with your help and support, the United Nations and the international community can and will step up,” he said. Among those in the audience at Stanford University today was 95-year-old Libba Patterson, the woman who hosted Mr. Ban in her home in Novato – a city outside San Francisco – in 1962 when he was a young student on his first-ever trip outside his home country of the Republic of Korea. While at Stanford, the Secretary-General is also expected to meet with university and local dignitaries, including former United States Secretary of State Condoleezza Rice and former Defense Secretary William Perry. He wraps up his visit tomorrow with a speech at the Monterey Institute of International Studies. Providing education, employment and empowerment for young people are key factors in achieving global progress, Secretary-General Ban Ki-moon said today at a meeting with educators and students in New York.